You can use timeshift to make a system snapshot before the upgrade. If anything goes wrong, you can easily restore your operating system to its previous state. Launch Timeshift from the application menu, follow the instructions on the screen to configure it and create a system snapshot. In the Update Manager, click on the Refresh button to check for any new version of mintupdate and mint-upgrade-info. If there are updates for these packages, apply them. 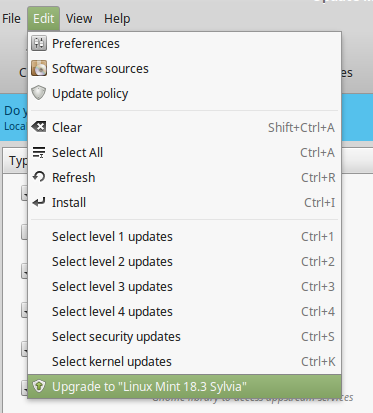 Launch the System Upgrade by clicking on ‘Edit->Upgrade to Linux Mint 18.3 Sylvia’. If asked whether to keep or replace configuration files, choose to replace them.